Coffee is what keeps many of us functioning. Unfortunately, good coffee can be hard to come by. Pre-ground coffee brewed at home can taste cheap or bland and brews from major chains are overpriced. But the perfect cup of coffee is out there. And it can be brewed right in your own home. You just need a coffee grinder. A coffee grinder can give you the professionally brewed taste you love without breaking your bank – and you don't even need to leave your kitchen. At the top of our list is the Rancilio Rocky Espresso Coffee Grinder. As the best coffee grinder for the price, you can expect to get a top of the line appliance at a price that reflects the quality of performance. This grinder is a little on the more expensive side but it is built to last. With an investment in the Rancilio Rocky, you won't find yourself needing to replace your coffee grinder in a few months or years. This one-time purchase will get you through cup after cup of your favorite coffee drinks. The Rancilio Rocky has 50mm plate grinding burrs, making it perfectly capable of handling all your coffee bean grinding needs, busting through up to 7.7 pounds of coffee per hour. 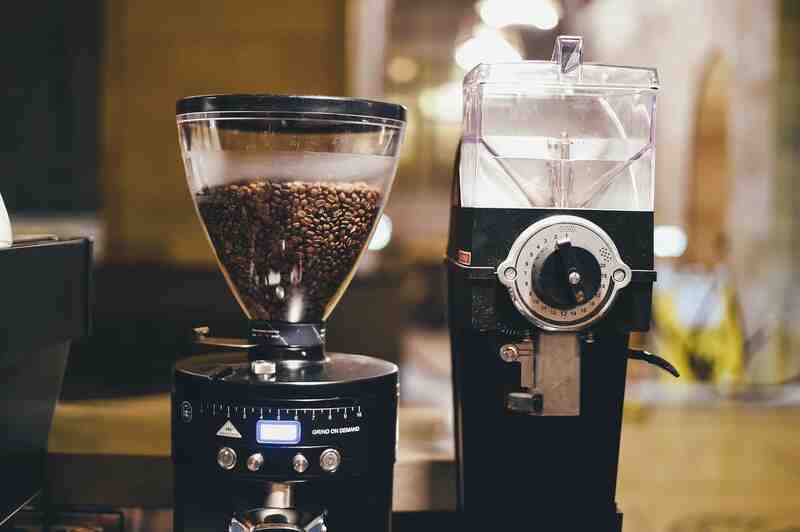 The hopper, located at the top of the grinder, can hold over half a pound of coffee beans, allowing you to simply press the start button whenever you're in need. The hopper is not removable, so you may run into problems if you are hoping to quickly switch between coffee beans or flavors. If you think you will need to make frequent changes, you will only want to put enough beans for the exact amount of grounds that you want. Although the grinder is extremely quiet, you shouldn't mistake that to mean it isn't powerful. 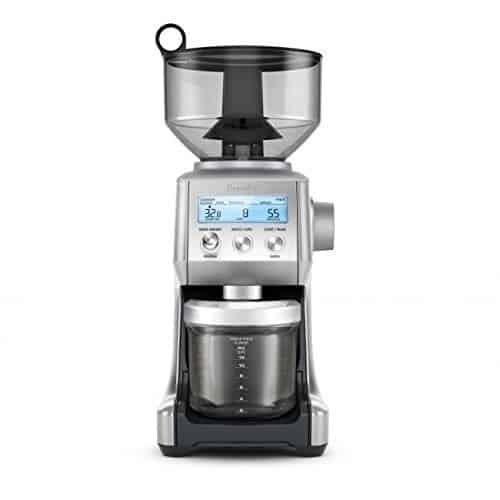 The 166-watt direct drive motor spins at 1725 RPMs to quickly cut through your favorite coffee beans, turning them into powder in just a few seconds. The Rancilio Rocky allows you to change grind setting quickly and easily. Simply unlock the lever and make a simple adjustment to the hopper, giving you the opportunity to grind your beans to the exact consistency you need. It dispenses the coffee grounds directly into a portafilter or other vessel of your choosing, so you can easily transfer them to your espresso machine or drip coffee maker. Each machine is tested using real coffee beans before it is packaged and shipped off. These individual tests ensure that your product does not have defects and is capable of performing to the highest standards and abilities. However, it also means that you may find some leftover ground residue in your coffee grinder after purchase. 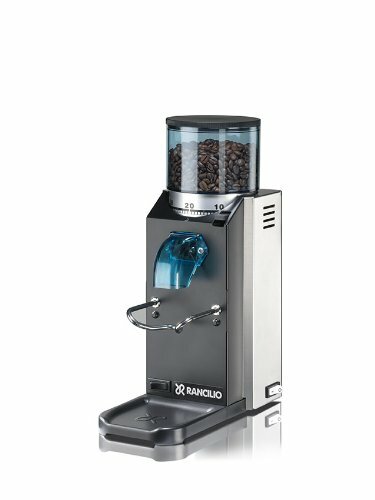 As a top rated coffee grinder, the Rancilio Rocky can meet needs both in the home and in commercial locations. If you're looking for a powerful grinder that is built for years of work, the Rancilio Rocky can be a great option. 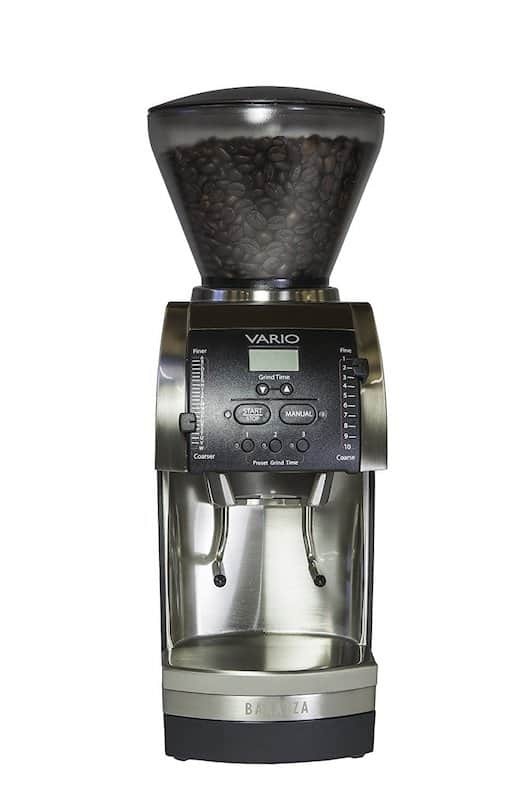 The Baratza Vario is only for the serious coffee lovers, and the price point reflects that. Although the price of the Baratza Vario is large, the appliance itself is small. It can tuck easily into open areas on your counter or in cabinets, so it will not take up too much space on your counter. As a smaller coffee grinder, this is also a great option for offices, dorms, or shared spaces. This burr coffee grinder is incredibly versatile, with 230 different grind settings. Through both macro and micro adjustments, you can get the exact texture you're looking for. Whether you're hoping to brew coffee in your press pot or you would like a fine grind for an espresso, the Baratza Vario allows you to get the most of your coffee grinder. The burrs of the Baratza Vario are 54 mm, so they grind accurately and precisely, but they are also ceramic, so they can stay stronger than standard stainless steel burs. As a powerful burr grinder, the Baratza Vario can grind up to 1.6 grams of coffee per second in the espresso setting and 2.2 grams of coffee per second at the press setting. It's designed to keep leftover grounds to a minimum in the grinder, keeping each brew fresh and tasting excellent. As a high-tech option for a coffee grinder, the Baratza Vario has a LED display that allows you to create pre-set grinding options. To quickly get your favorite grinds for your most desired coffee drinks, simply hit one of the pre-set buttons and you don't need to worry about adjusting the settings. 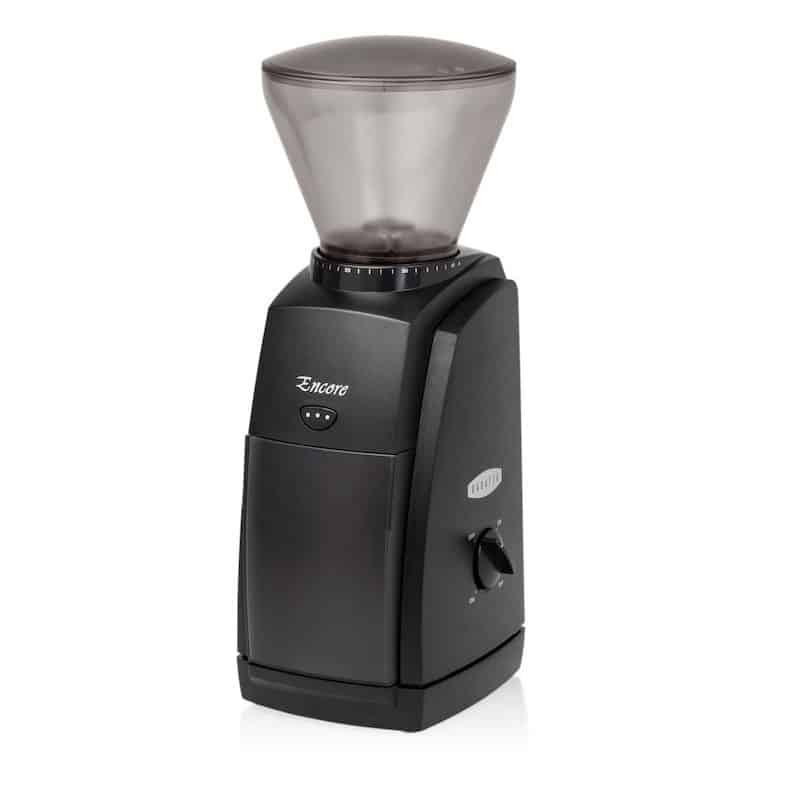 The Baratza Vario also comes with a Portaholder, so you do not need to hold your filter during the grinding process. Simply set up the coffee grinder to your liking, press the start button, and let it go until it is finished. This allows you to complete the rest of your prep while the coffee is grinding. Getting the perfect cup of coffee or espresso relies on using just the right amount of your favorite coffee grounds. With grinders that put the pressure on you to stop the machine when you have enough, it is easy to get too little or too many grounds – affecting the taste of your favorite coffee drinks. But the Breville Smart Grinder makes it easy for you to easily set the grind time to get the perfect amount of coffee. With 0.2 second increments, adjusting the grinder to only cut through the exact amount of coffee beans that you need is easier than ever. The Breville Smart Grinder also has 60 different grind settings, ranging from fine grinds for making espresso to coarse cuts for using your favorite French Press. For coffee lovers of all kinds, this top rated coffee grinder can be a one-time purchase to cover all your needs. To go with the wide variety of grinds, this grinder also allows you to catch the ground coffee with whichever vessel or filter makes the most sense for your kind of brewing. Choose to have your coffee grounds go directing into the portafilter, a gold-tone basket, or even paper filter. Or if you're looking to grind all your beans at once, they can go directly into a container. It has hopper can hold up to 16 ounces of coffee beans. The burrs of this coffee grinder are conical, which help to reduce heat while operating. Because the conical burrs can stay cooler than other materials, it does not compromise the essential oils in your coffee beans. Because the Breville Smart Grinder focuses on delivering precise measurements and grind times, you know you're getting a consistent grind each time you use the appliance. While this is great for the home or the office, it can also be a strong option for businesses looking to provide a consistent product to customers. While many grinders on this list boast having many different options, settings, and features, the Baratza Virtuoso boasts simplicity and ease of use. But don't mistake that to mean it can't handle all of your coffee needs. It has a clean and simple design, free off too many knobs, levers, or adjustment bars that can make it difficult to use or understand. Instead, the design is clean, with just a dial for adjustments and an on and off switch to begin the grinding process. The top hopper can be twisted to adjust between 40 different settings, ranging from fine grounds for espresso to coarse grounds for the French Press. With a 60-second timer option, you can also easily get a consistent amount of grounds each time you use the appliance. It has a number of systems in place to prevent heating of the coffee grounds during grinding. First, as a conical burr grinder, the burrs themselves will stay cooler than stainless steel or other materials. At 40mm, the conical burrs make this a great coffee grinder for espresso lovers. The motor of the Baratza Virtuoso works efficiently, preventing itself from overheating and heating the coffee beans. Gear speed reducers will also slow the burrs when necessary to both prevent heat from reaching the beans but to also keep noise to a minimum while grinding. It's sleek and simple design makes it a great option for leaving on your counters or even tucked away in an office. Because it is small and simple, it can easily be stored when it is not in use. However, the simplicity of this model is not for everyone. If you're looking for an easy to use burr grinder that you can rely on, but does not have all the added bells and whistles that other models have, the Baratza Virtuoso can be the right option for you. If you want to take total control of your coffee grinding, you may want a grinder with more options. The Baratza Virtuoso may not be a cheap coffee grinder, it is still an affordable enough option to not break your budget. One of the biggest benefits of buying a coffee grinder at home is to stop spending your money on overpriced coffees each morning. But if you're on a budget, it probably means you don't have hundreds and hundreds of dollars to spend on your coffee grinder. For a cheap coffee grinder that can still give you a high-quality grind, the Baratza Encore is the best option for you. Called an "entry-level grinder," the Baratza Encore is the easiest to use grinder on this list. The Baratza Encore is great for the college student, young professional, or individual just starting to learn about making excellent coffee at home. While this grinder is simple to use, it still has 40 different grind settings to give you just the right amount of ground texture you need for brewing. With 40 mm conical burrs, the Baratza Encore will stay sharp for many years. Like the Baratza Virtuoso, this machine takes extra precautions to reduce the heat that the coffee beans feel during grinding. The DC motor works efficiently to prevent overheating and gear speed reducers can reduce noise and static buildup. To adjust the coarseness or fineness of the grounds, simply rotate the hopper until it is at the texture that you're looking for. Then, to operate the Baratza Encore, you can either use the side dial to start a hands-free grinding process or press the front pulse button to grind just the right amount of beans. It's the best coffee grinder for espresso and manual brew coffee for the home or office. Without the many different dials, settings, or functions that you may find with more advanced coffee grinders, the Baratza Encore can be used by individuals of any age or level of experience with coffee grinders. That being said, the Baratza Encore may disappoint if you are looking to create incredibly intricate or precise coffee drinks. For professional baristas or avid lovers of espresso, a more expensive and more feature-full grinder may be a better option. With grinders at all levels of functionality, features, and price points, there is sure to be a grinder that fits your needs. Take a moment to consider what grinding features are important to you. Are you new to the coffee grinding game, just wanting to purchase something reliable to get the job done? Are you ready to start exploring the advancements of coffee grinding and espresso brewing? If you want a cheaper option, you should consider a manual coffee grinder. Did you ever test or does anyone make electric Burr conical grinders in ceramic? All I come across as ceramic are hand operated. The Baratza Vario has ceramic burrs, but they are flat, not conical. I didn't find what you are looking for.